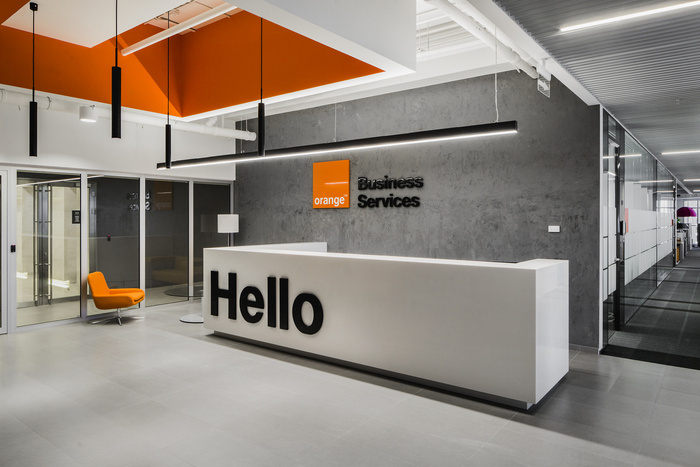 T+T Architects has designed the new offices of Orange Business Services located in Moscow, Russia. The functionality of the workflow of the company was laid into the basis of the plan. However, subsequently, some of the solutions reacted to the building with the unique architecture. The principle of an open workspace is popular all over the world. However, here the customer has built a distinct functional process in which the tasks go through a kind of “assembly line” of departments and specialists. The final placement of the departments follows this scheme. The office is divided into working areas and points of informal communication evenly spread over the entire area of the floors. At these points architects set the accents based on the form of circle in a particular embodiment. Workspaces are made contrastingly – in the orthogonal forms and monochrome materials. Part of the informal communication points were integrated in the center of some departments showing the inextricable workflow and the process of dialogue, discussion. Every office has a central place of concentration of the design. In this case it was not only the reception and the main entrance zone on the 11th floor, but the adjoining relaxation area with a unique internal staircase. Thanks to the unusual architecture of the building this difficult solution was implemented. Monolithic spiral staircase became the center of the office. Two large recreation areas are concentrated around it. Thus, the office received a public space where you can meet most of the staff. It is convenient to have a morning brief or any special event here: there are large kitchen, coffee points and a conference hall in proximity. Great attention was paid to the corporate standards. The international office of the company provided the architects with a detailed brand book with a lot of restrictions and recommendations. The T+T Architects bureau managed to create unique solutions without breaking the basic corporate strategy.